Ok, I didn’t really get any bling, but I got books, and in my household, books are a lot more important than bling. There is nothing I like more than a Barnes and Noble giftcard! 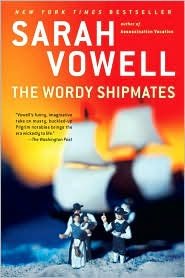 In The Wordy Shipmates, Sarah Vowell travels once again through America's past, this time to seventeenth-century New England. From the British Library to the Mohegan Sun casino, from the nation's first synagogue to a Mayflower waterslide, Vowell studies the Puritan effect and finds their beliefs about church and state more interesting than their buckles-and-corn reputation would suggest. 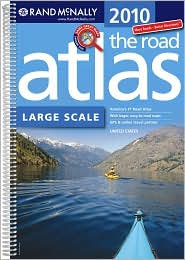 An atlas you ask? Because we are getting ready to take a major road trip in the spring and I want to be prepared! In the opening pages of Jamie Ford’s stunning debut novel, Hotel on the Corner of Bitter and Sweet, Henry Lee comes upon a crowd gathered outside the Panama Hotel, once the gateway to Seattle’s Japantown. It has been boarded up for decades, but now the new owner has made an incredible discovery: the belongings of Japanese families, left when they were rounded up and sent to internment camps during World War II. This book has intrigued me since it was first published. I thought if I finally had it on my shelf I might be motivated to read it. Now, I need to go have some cake for breakfast! Wow, this is a great birthday indeed! Enjoy your bookish gifts. Happy Birthday! 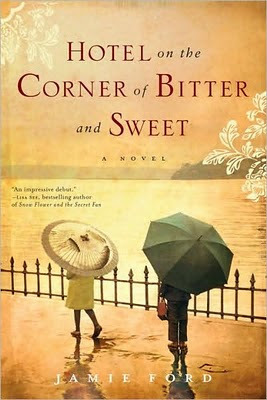 I have read the book, "Hotel on the corner of bitter and sweet" and I really enjoyed it! I hope you like it. I tried to send you an email but it got bounced back. I’d like to invite you to write about your favorite books at www.bookdrum.com, where you can add information, images, video, music and links to illustrate and explore the books. Right now, we're running a $3,000 Tournament and we'll be offering contract work to the best entries. Happy Birthday! I can't wait to read what you think of 'Hotel on the Corner of Bitter and Sweet'.